This new era is called the "Era of Hard Work." Ted Cruz was able to overcome the money and resume of David Dewhurst. There is probably no Republican group, no matter how small, in Texas that has not hosted Ted Cruz. Embracing and empowering the grassroots years before and during the primary with hard work is how Ted Cruz was able to stun some of Austin's most shrewd political consultants. I personally found myself having to recognize Cruz's payoff when I was at Dewhurst's election night party. 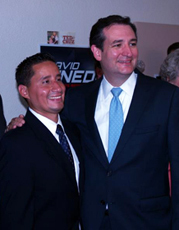 Ted Cruz, on Wednesday, visited David Pineda in an effort to add to already strong firepower of the get out the vote machine of Pineda in House District 144, Pasadena, Texas. Cruz continues to work hard and spread the wealth to other Republicans around the state as explained by respected blogger David Jennings of Houston. David Pineda has placed his history making campaign in a very good position for November 6th by using the same blueprint of hard work. On some days David Pineda, the focused Marine, was able to personally match the block walking of the entire Democrat ACORN machine for his opponent, matching door for door, house for house. Pineda has personally had a knife pulled out on him, his team has had dogs released on them, and even a volunteer had his cell phone stolen from him while block walking. Still this has not stopped the hard working grassroots machine of the David Pineda campaign from taking the message of the Republican Party into Pasadena's 74% Hispanic district. These two examples of hard work gives us the secret to our future success as the demographics shift in Texas. Anyone can talk outreach, doing it is the tough part. As we travel around the state of Texas pushing forward the concept of Hispanic outreach through the Republican party as the vehicle, we can rest assured that now more than ever, the grassroots of our party is primed to meet the challenge of winning more hearts and minds.